If someone puts their hands on you make sure they never put their hands on anybody else again. I see America through the eyes of a victim. I dont see any American dream. I see an American nightmare. We cannot think of being acceptable to others until we have first proven acceptable to ourselves. To me, the thing that is worse than death is betrayal. You see, I could conceive death, but I could not conceive betrayal. I have often reflected upon the new vistas that reading opened to me. I knew right there in prison that reading had changed forever the course of my life. As I see it today, the ability to read awoke in me some long dormant craving to be mentally alive. If you don't stand for something you will fall for anything. New Updates! (4/25/2019) We've been working really hard on completing our membership system so you can submit quotes and keep track of them. Once this is complete in the coming weeks there will be a lot more quotes by Malcolm X and other authors. We've also changed the sorting on the site so you now see the latest Malcolm X quotes first. 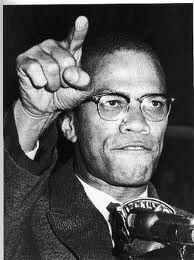 Our goal is to have the best Malcolm X quotes on the web!